A View From The Hook: Reporting from the Brooklyn "Vision 2020 - NYC Comprehensive Waterfront Plan" Workshop. Reporting from the Brooklyn "Vision 2020 - NYC Comprehensive Waterfront Plan" Workshop. Monday night, the Department of City Planning held their Vision 2020 public workshop for the borough of Brooklyn (previous post, here). They had already held their first city-wide workshop last month, and will be holding others in all of the boroughs over the next couple of months. These gatherings are being undertaken in order to get ideas from the community about what is needed when it comes to future development of the city’s waterfront – this one focusing on Brooklyn, specifically. The workshop, held at Brooklyn Technical High School, started off with a couple of statements from Purnima Kapur, from the Department of Planning (Brooklyn) and representatives of the NYC Economic Development Corporation (EDC), the agencies that will be intimately involved in the planning and implementation of whatever plans the recommendations arising from the Vision 2020 Planning process produce. From the EDC, Executive Vice President Madelyn Wils spoke. She listed the EDC’s recent accomplishments on Brooklyn’s waterfront, speaking of the recent “Sunset Park Waterfront Vision” plan, (my post here) including a new 22 acre public waterfront park and more housing, that had come out of a process that involved consultation with residents, business and industry groups, and was done in co-ordination with Sunset Park’s 197a Plan. Then she noted the relocation of Phoenix Beverages to the Red Hook waterfront (at Piers 7 and 11), relocating their beer distribution operation from Long Island City, in Queens. Ms. Wils said that the EDC’s work in bringing Phoenix to the Red Hook piers created a “new paradigm” for the business being done on the Red Hook Waterfront. This “new paradigm” is being felt in the neighborhood right now, as Phoenix Beverages (a.k.a. Long Feng Trucking) and their 200 truck trips a day rumble - or even race - through our residential streets, instead of using the inside roads within the Container Terminal site, as Phoenix and the EDC promised. Meanwhile, the residents are wondering if the polluting diesel trucks will ever be converted to Compressed Natural Gas (another promise), and are still scratching their heads as to why Phoenix was coerced into taking both Pier 7 and Pier 11, when they only ever needed or requested the use of one pier. (Phoenix’s first choice was actually Pier 7 only). 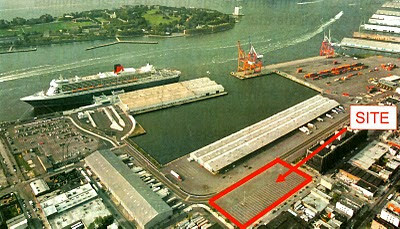 The tying up of most of Pier 11 on the Atlantic Basin for 20-years (secured with Phoenix’s lease with the EDC and the Port Authority’s approval) meant the exclusion of more open space, more public access, physical and visual corridors to the waterfront, water taxi service and other – dare I say – resident friendly elements, many that were outlined in Red Hook’s own 197a Plan and articulated in multiple meetings and within Community Board 6 guidelines. Ms. Wils' “new paradigm” not only brings more trucks, as I mentioned, but also brings the expansion of the operation of the Container Terminal (which has now repossessed most of Pier 11, by proxy, at least), without including any measures to address and abate the pollution that is being created by the additional trucks and ships. They didn’t even do an Environmental Impact Study – or a proper assessment of the impact of truck traffic on street congestion. This isn’t such a surprise, coming from the EDC, as they were the agency who, in 2006, brought to our neighborhood a new, state-of-the-art cruise terminal without including the “shore power” infrastructure that would ensure the new presence of cruise ships and the dangerous smokestack emissions they produce didn’t have any detrimental health impact on our already burdened community. These additional, unaddressed health costs, in human terms (cancer, asthma, lung disease, heart disease, etc), have been carried in our community for the last 5 years. Additionally, the Port Authority recently stated that the monetized health costs of the unmitigated emissions created by the cruise ships burning of their extra-dirty diesel fuel while in port approaches $9 million a year (my post here). That’s from the cruise ships alone. That doesn’t include the additional pollution from the dirty-diesel burning container and cargo ships. People’s health being compromised in the name of “economic development”. That’s some “new paradigm”. Anyway, moving on, the next speaker was Michael Marella, the Vision 2020 Project Manager from the Dept. of City Planning, His presentation outlined the history of New York waterfront planning, the broad goals of the workshops and the goals of the Vision 2020 Plan as a whole. These are pretty well articulated in this story (with video!) from NY 1. The whole group was then split off into smaller groups of 20 or so made up of people representing different sections of the Brooklyn waterfront. In the spirit of the maritime subject matter, each section of the waterfront was called a “reach” – reaches are segments of waterfront. Our group, made up of residents, architects, environmental experts, barge operators, small business people, fishermen, community representatives, people in government, arts and culture organizers, members of the Metropolitan Waterfront Alliance, etc. represented the Brooklyn waterfront from Atlantic Avenue, through Sunset Park to Owl’s Head . This section was termed “Reach 14, South”. It was noted by our coordinators from the Dept. of City Planning that between the end of the new Brooklyn Bridge Park, at Atlantic Avenue, and the end of Van Brunt Street there was currently only one point for public waterfront access – Valentino Pier. 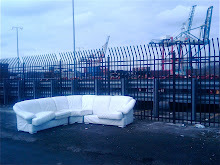 Other sites noted where there was currently public waterfront access in our reach included the Fairway promenade, the Ikea Erie Basin Park and the Lowe’s parking lot on the Gowanus Canal (the mention of the latter was greeted with a few well deserved chuckles). Piers 7-12 along the Red Hook waterfront and the Atlantic Basin. The old Revere Sugar site, now owned by Thor Equities. 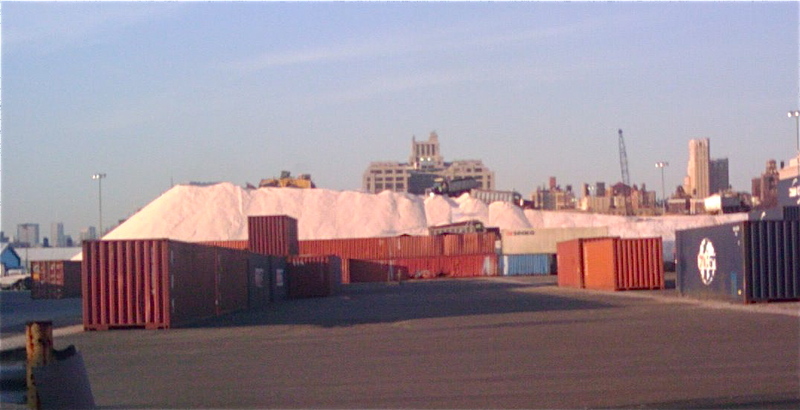 The Sunset Park waterfront, including Bush Terminal, etc. What about Governors Island? 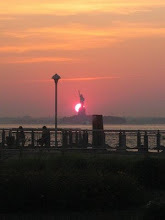 - or at least the recognition of Red Hook and the Columbia Street Waterfront’s proximity and connection to the island. Various street ends, where they meet the waterfront (Gowanus Canal included). The parking lot and possible sea wall walkway at the ATF building situated on historic “Point Defiance”, next to Valentino Pier. As the discussion of what we would like to see on these sections of the waterfront proceeded, many issues and proposals were raised. Someone had a plan for creating an elevated roadway above 1st Avenue, approximately the length of what is now the elevated Gowanus Expressway. The old expressway would then be demolished opening up 3rd Avenue and creating a boulevard. This was proposed as an alternative to building a tunnel from the Battery Tunnel to the Belt Parkway, which has been a plan many have supported (including ex-Senator Clinton) for decades. The people interested in the Gowanus Canal area had ideas for the “sponge park” and other water cleaning proposals. As with many of the comments regarding different sections of the waterfront, the issue of adaptation to climate change and a rise in sea level was seen as being of great importance. There was widespread enthusiasm for greater access to the waterfront, including open space and recreational access – kayak launches, etc. – and the connection to the Brooklyn Greenway was seen as being vital. Regarding the Thor Equities owned Revere Sugar site, there was overwhelming consensus that this should not be the location of a big box store, such as WalMart. Some suggested housing or mixed use for the site, but Bob Hughes, the operator of the barge and tug boat operation in the Erie Basin, suggested that his proximity to the site should preclude the use of the site for housing, saying it was incompatible with his business. (I wonder whether that is actually the case - I should have asked Bob whether he got any complaints from the residents in the Fairway building that is not as close as the Thor site, but still within earshot of the bargeport. My feeling, based on observations from my old home town of Sydney and elsewhere, is that often these types of uses can co-exist, and their co-exitsence adds to the character and vitality of neighborhoods such as ours. I mean, people are living in apartments right next to the BQE! Whatever the case, it would seem unfair to force the bargeport out of its historic home in the name of any kind of development). In that spirit, there was also the acknowledgment that there must be a balance in whatever is developed on the waterfront – balancing maritime industrial uses, real jobs, residential development, the livelihood of store owners, waterborne transportation, public waterfront access and the additional open space and parks that the residents seem to be craving. It was also noted that whatever came to the waterfront should not impose any unnecessary health or pollution burden on the residents, nor unacceptable congestion on our streets, as had both been the case with my previously mentioned examples – the Cruise Terminal and Phoenix Beverages. Some people from the Columbia Waterfront voiced their great concern about the promises that had been broken by Phoenix regarding their truck routes and the real impact these broken promises were having on their quality of life. The port pollution issue was one that was raised by me, in relation to the operation of the Red Hook Container Terminal and adjoining Cruise Terminal, and was also raised by residents from Sunset Park. As well as having some concerns about their new “Sunset Park Vision Plan”, and stating that any new industrial use at Sunset Park should not have an environmental nor health impact on their residents, they also voiced an insistence that if a Container Terminal was to be developed in Sunset Park, ready for larger post-Panamax ships, as has been suggested, then it should be done in a “green” way – using modern technology such as “shore power”, clean vehicles, electric cranes etc., so that the operation of that port doesn’t impact their residents adversely. I added that I didn’t think the residents of Red Hook would wish the pollution and adverse health effects that they had been enduring all these years on the residents of Sunset Park. It’s interesting to me that the issue of pollution was not really on the agenda. The Dept. of Planning had stated that one of the goals of the plan should be to “maintain and improve the environmental quality of our waterbodies”, but that referred to the water itself, not the activities that rely on it. In all of the points listed in the various handouts, including the “Preliminary List of Goals and Issues” distributed at the workshop – a list that contained 7 goals, and 27 specific issues under the headings: Natural Waterfront; Working Waterfront; Public Waterfront, Mixed Use, Residential and Commercial Waterfront; and Blue Network (which includes transportation and freight movement, alternative energy, etc) - not once was mentioned the idea that the activities of the ports are actually polluting, and that the Vision 2020 Plan should acknowledge that fact and seek out a strategy to mitigate this pollution and its detrimental health effects. The plan does mention that the city needs to ready itself for more shipping and larger ships (like the post-Panamax ones I mentioned) by dredging channels and raising bridges (as is being planned with the Bayonne Bridge), but there is no mention of the challenges that this uptick in shipping size and volume and resultant increase in pollution, if unmitigated, will pose to the health of our city's residents. “Well, we have been 'victims' - collateral damage, if you will, in the name of "economic development" and special deals - and you cannot plan a future for Red Hook that exposes our residents to more of the resultant harmful pollution. You cannot plan for our waterfront without paying attention to the neighborhood it abuts and the stated needs of its residents. Any planning needs to address all of these factors, especially the burden pollution is placing on our port communities. Attention needs to be paid to planning for that reality; where such a terminal makes sense and where investments should logically be made to mitigate pollution - long term - and you should be including these points in all of your presentations. I managed to chat with Mr. Marella after the workshop, and he seemed to be cognizant of the fact that there was a gaping hole left in the Vision 2020 Plan by the exclusion of these important issues. He mentioned that the Dept. of Planning was working closely with the Port Authority, and that he thought these issues would be ultimately acknowledged. I really hope so. Enforcement of 197a Plans, etc. Let's hope that all of this public input counts for something. There will be another city-wide "workshop", after the borough specific ones are completed, on June 24th, and - another reason to put this one in your book - it will include discussion of the "Blue Network" that will address issues of waterborne transportation, recreation and education, as well as ecology and resilience to climate change. You can get more information and post your comments online at the Vision 2020 website - www.nyc.gov/waterfront.